Partial cloudiness early, with scattered showers and thunderstorms overnight. Low near 70F. Winds S at 10 to 20 mph. Chance of rain 50%.. Partial cloudiness early, with scattered showers and thunderstorms overnight. Low near 70F. Winds S at 10 to 20 mph. Chance of rain 50%. 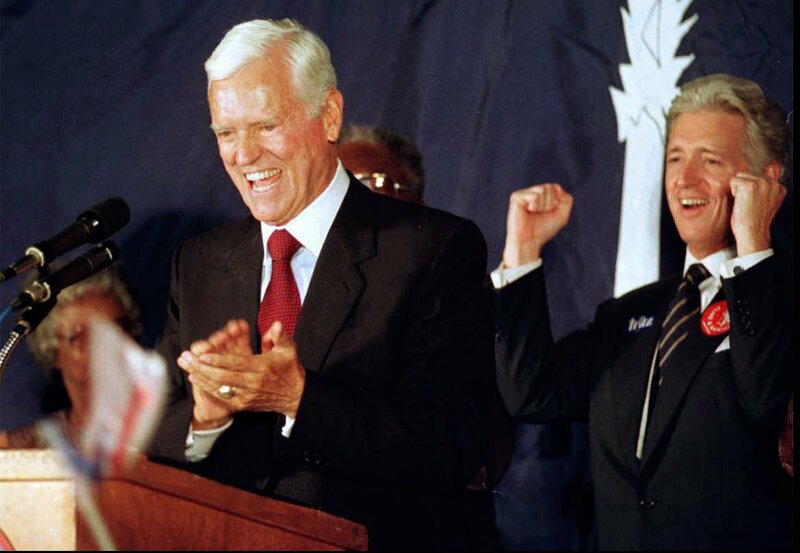 Ernest Frederick “Fritz” Hollings, the charismatic and quick-witted former U.S. senator and South Carolina governor who became one of the state's most important national political figures, died early Saturday after a period of declining health. "Our father, Fritz Hollings, was dedicated to his family, the United States Senate and the people of South Carolina," his three surviving children said in a statement. "He was a hero for us and millions of Americans. Hollings will lie in repose at the S.C. Statehouse on April 15. The funeral will be April 16 at The Citadel, his alma mater. In a career that spanned more than half a century, Hollings steered South Carolina through the civil rights era, established a program to feed poor pregnant women, enacted legislation to protect the environment and brought home millions of dollars as he also fought to balance the federal budget. No recent history of the state could be written without him in it. "Fritz Hollings was truly a man in full — a history-making governor, a titan of the U.S. Senate, and a peerless friend to all who were fortunate enough to know him. Our state and nation have lost a real giant," Charleston Mayor John Tecklenburg said. Tall, white-haired and speaking with a recognizably pure Charleston accent, Hollings was once described by The New York Times as the figure you would call from central casting if a director needed someone to appear as a U.S. senator. The Charleston native, Citadel graduate and lifetime Democrat was one of South Carolina's most productive figures of the 20th century. A World War II veteran known for his sharp tongue and sharper mind, Hollings rose through the ranks of the General Assembly, beginning with his election to the state House of Representatives in 1948. After a stint as governor, beginning in 1958, he turned to a private law practice before returning to politics in 1966, filling the U.S. Senate seat vacancy created by the death of Olin Johnston. He would serve in Washington, D.C., for nearly 40 years, all but two of which were as the “junior” senator from South Carolina to Republican Sen. Strom Thurmond. Hollings rose through the ranks of the Democratic leadership to become chairman of the powerful Commerce Committee. In 1984, he briefly ran for president of the United States, failing to gain much traction. In a much-repeated gag, he made fun of his dismal performance, joking that New Hampshire voters thought of him as "Fritz Haulings" after a supposed German moving company. Among his many accomplishments, Hollings was credited with the creation of the National Oceanic and Atmospheric Administration, toughening port security and, in his last term, setting up airport security after the 9/11 attacks. He also helped develop some of the nation’s most important environmental regulations. In the early 1980s, he sponsored landmark legislation to cap runaway federal spending, the Gramm-Rudman-Hollings Act, but soon grew disgusted with those who found ways around such laws. As governor, he is credited with building South Carolina’s network of technical colleges and promoting the state’s textiles industry, as well as growing its budding educational public television network. In 2015, Hollings asked that his name be removed from Charleston’s federal courthouse in favor of J. Waties Waring, the judge who orchestrated the Brown v. Board of Education Supreme Court ruling that desegregated public schools. It was, U.S. Rep. Jim Clyburn of Columbia said, the first time in history anyone had asked to have their name replaced on a federal building. Public officials hailed Hollings’ actions as a grand gesture to history — a history he had no small part in writing. "South Carolina's had many outstanding public servants, but he was the best and most consequential," former Charleston Mayor Joe Riley said. "He was honest and courageous. He did what he thought was right without regard to political consequence." Former Vice President Joe Biden, who spoke by phone with Hollings on Monday, called his longtime Senate deskmate "a patriot who fought for his country in uniform and elected office." Hollings was "a friend who lifted me up when it mattered the most early in my career, and taught, as he's done for generations of South Carolinians, how to live a life of purpose and service," Biden said. S.C. Gov. Henry McMaster said, "One of South Carolina’s greatest lions roars no more. Fierce, bold and robust — the sounds of Fritz Hollings’ vision and drive for the Palmetto State will continue to be heard by generations." Clyburn, the third-highest ranking House member, said he has spent recent days studying Hollings' work on hunger and poverty, including his tour of poor neighborhoods of Charleston 50 years ago that inspired the federal program to provide food assistance for pregnant women with children. "Fritz was a giant of a man who was often called the 'senator from central casting,' " Graham said. "When it came to South Carolina, Fritz could move mountains in the Senate. "And until his dying day, Fritz Hollings was always advocating and urging for policies that would make our country strong." Hollings was born in Charleston on Jan. 1, 1922. His father was a paper products merchant during the Depression. At age 16, Hollings enrolled at The Citadel and, four years later, graduated as part of the military college’s Class of '42 that went on to fight in World War II. Another future governor, John West, was among his classmates. After graduation, Hollings joined the Army and saw action in North Africa and the south of France. He earned seven combat stars and finished his service at the rank of captain. After the war, Hollings returned to Charleston where he married his first wife, Patricia Salley, in 1946. They had four children. Hollings graduated from the University of South Carolina law school and in 1948 at age 27 took off on a fast track in the world of politics, winning a seat in the state House representing Charleston. He eventually wrote the legislation that established the state’s first sales tax, and then-Gov. James Byrnes used much of the resulting revenue to improve black schools — an attempt to avoid federally mandated integration. By all accounts, Hollings was a quick study at politics. At 29, he was elected Speaker of the House. In 1954, he was elected lieutenant governor. Four years later, at the age of 36, he became governor in an upset win over Donald Russell. Hollings’ early career as a Statehouse lawmaker and then governor was marked by an open support of continued segregation in South Carolina. However, he also wrote legislation that created the state’s anti-lynching law — which was aimed at the Ku Klux Klan. He served as a lawyer defending the state’s position on segregation, representing South Carolina before the U.S. Supreme Court in what would become the state’s entry into the 1954 Brown v. Board of Education school desegregation lawsuit. Years later, Hollings would say the state was on the wrong side of morality. As governor of South Carolina from 1959-63, Hollings oversaw what would be the peaceful integration of black Charleston resident Harvey Gantt as a student at Clemson University, and boasted a successful record toward desegregating the public schools without South Carolina experiencing the violent backlash seen elsewhere in the South. He created the state’s multi-county technical school system in the face of stiff resistance, reasoning that the only way the state could compete on the global scale was to have an educated workforce beyond the generations that had grown up in mill towns. Hollings also fostered growth at the Port of Charleston as a way to export South Carolina’s textiles around the world. Decades later, Hollings would correctly forecast the demise of the state’s textile industry to Mexico and Asia as a result of the North American Free Trade Agreement, which he strongly opposed. After four years as governor — the maximum term at the time — Hollings turned to private law practice. Within three years, he ran for the U.S. Senate in a 1966 special election. Political scientists credit Hollings’ political longevity, in part, to arriving in Washington after passage of the nation’s major civil rights laws. From there, he was able to build a constituency of black and white voters. One of Hollings’ first undertakings was a tour of the poor, rural South. He documented his findings in the 1970 book “The Case Against Hunger” and led the charge to create the national Women, Infants and Children program to feed poor pregnant women. That same year, Hollings divorced his wife. A year later, he married Rita “Peatsy” Liddy of Charleston, who would become his constant companion and political confidant. For years onward, Hollings would rarely be seen in public without her. In the early 1980s, Hollings co-authored the bipartisan Gramm-Rudman-Hollings Act that was seen by many as a landmark attempt to put caps on the runaway federal spending with a mandate to balance the federal budget. Hollings later self-“divorced” himself from the legislation, saying budget-writers had found ways around its provisions. In 1984, after three terms in Washington, Hollings briefly sought the White House. His campaign went nowhere, with the Democratic nomination eventually going to former Vice President Walter Mondale. Hollings said his effort was partially geared to recover from the embarrassment President Jimmy Carter’s 1980 defeat caused Southern Democrats. Hollings withdrew early in the process, during the New Hampshire primary, where he was largely considered a novelty because of his Southern mannerisms and distinctive Lowcountry drawl. But he still remained a player on the national scene. Other accomplishments associated with Hollings include the preservation of 217,000 acres of the ACE Basin south of Charleston, the creation of the Congaree National Park near Columbia and the Hollings Cancer Center, the oncology arm of the Medical University of South Carolina. The center was formally established in 1993 and named for Hollings, who helped secure federal funding to create the research center in 1987. Hollings was given the honor because of his "legacy of public service, serving our culturally and socioeconomically diverse state," MUSC proclaimed. Get the latest political news from The Post and Courier in your inbox. Hollings was also instrumental in securing federal money for the Arthur Ravenel Jr. Bridge, which replaced the previous Cooper River bridge in 2005. Occasionally labeled brash and arrogant, Hollings’ frequent slips of the tongue became legendary. Sen. Howard Metzenbaum of Ohio, who is Jewish, was once described as “the senator from B’nai B'rith” in a reference to the Jewish service organization. Hollings and Metzenbaum, who died in 2008, later buried the hatchet, and Hollings’ words were stricken from the Congressional Record. Other miscues came when Hollings described African potentates as cannibals who would fly to Switzerland seeking a four-star meal. When McMaster ran against Hollings for Senate in 1986 and suggested Hollings take a drug test, the quip backfired. "I'll take a drug test," Hollings said, "if you'll take an IQ test." When Hurricane Hugo struck Charleston in 1989, Hollings railed at the Federal Emergency Management Agency on the Senate floor, calling its leaders “bureaucratic jackasses” for their slow response. It was all part of an unapologetic package the senator projected. “Providence has blessed him with an appearance so striking that rank strangers assume he must be important,” the Times said. Hollings would later perform an acting cameo as a U.S. senator in the New York-based political drama “City Hall,” starring Al Pacino, John Cusack and Bridget Fonda. Watching the Republican takeover of the South unfold, Hollings retired from the Senate in 2004, giving up his seat after a 38-year career on Capitol Hill that spanned the terms of eight U.S. presidents. He spent his final years openly critical of Republicans running up the budget by spending wildly and cutting taxes to the rich. His wife Peatsy died in 2012 after a long battle with Alzheimer's disease. He would spend his latter years advocating for research to find a cure. For years after his retirement and living on Isle of Palms, Hollings frequently penned op-eds calling for fiscal restraint. In 2015, he asked to have his name removed from the Charleston federal courthouse and replaced with Waring’s. In April 2017, Hollings’ grand gesture to history was commemorated when a statue of him was unveiled at the courthouse and placed beside a statue of Waring. "His last act in public life was to have his name removed from a building," U.S. District Judge Richard Gergel of Charleston said. "It was a singular act of graciousness and humility." Biden, a longtime friend, delivered the keynote address at the dedication. Biden said Hollings' request to rename the courthouse was the epitome of his selfless service to the nation. Hollings was overcome by the moment. Those were his last public sentiments. Visitation will be 3-6 p.m. April 14 at James A. McAlister Funerals and Cremation in Charleston. Hollings will lie in repose from 10 a.m.-5 p.m. April 15 at the Statehouse in Columbia . The funeral is set for 11 a.m. April 16 in the Summerall Chapel at The Citadel in Charleston. A private burial is scheduled after the service. In lieu of flowers, memorials can be made to the Hollings Cancer Center at MUSC, 86 Jonathan Lucas St., Charleston, SC 29425. Reach Brian Hicks at bhicks@postandcourier.com. Former South Carolina Governor and United States Senator Ernest "Fritz" Hollings through the years. The Post and Courier remembers the life of Ernest F. "Fritz" Hollings. Top political leaders and friends share their thoughts and memories of the former U.S. senator and S.C. governor who passed away Saturday at age 97. Editor's note: Former Charleston Mayor Joe Riley wrote this letter to Fritz Hollings on Tuesday. Hollings' family read it to him Wednesday evening, less than three days before he passed away at the age of 97. Schuyler Kropf is The Post and Courier political editor. He has covered every major political race in South Carolina dating to 1988, including for U.S. Senate, governorship, the Statehouse and Republican and Democratic presidential primaries. Shain runs The Post and Courier's team based in South Carolina's capital city. He was editor of Free Times and has been a reporter and editor for newspapers in Charlotte, Columbia and Myrtle Beach. Send your politics questions and/or tips to our team by emailing politics@postandcourier.com.